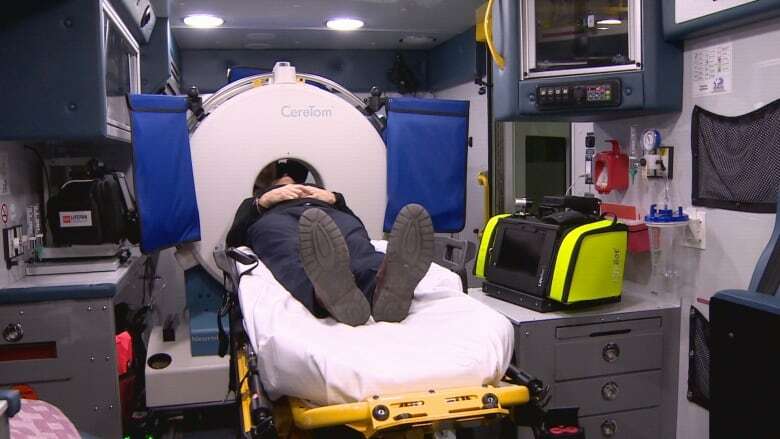 Canada's first stroke ambulance, equipped with a CT scanner, will begin operating in Edmonton in January as part of a three-year pilot project. It will allow for quicker treatment of patients in rural areas without access to CT scanners. 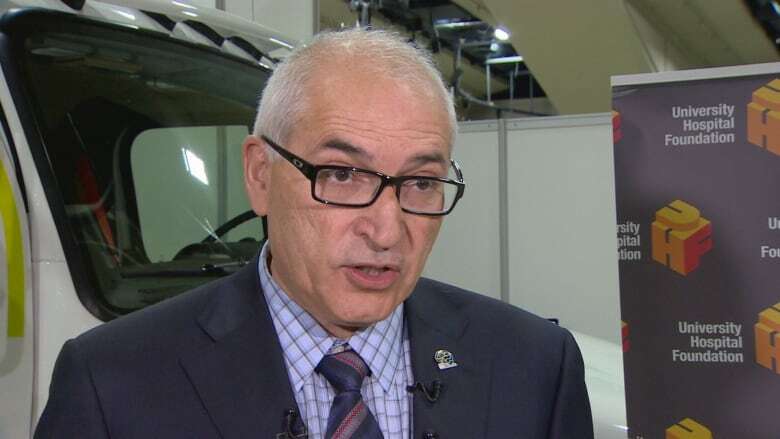 Canada's first stroke ambulance, equipped with a CT scanner, will begin operating in Edmonton in January as part of a three-year pilot project. The ambulance, valued at more than $1 million, will allow for quicker treatment of people in rural areas without access to a CT (computerized tomography) scanner, where minutes can make a big difference to a patient's outcome. "If you block an artery to the brain, within seconds the brain cells start to die out," said Dr. Ashfaq Shuaib, a neurologist at the University of Alberta Hospital. "Every minute that an artery to the brain is blocked, there's two million brain cells dying." Blocked arteries cause about 80 per cent of the strokes seen at the U of A Hospital, with the remaining 20 per cent caused by hemorrhage, or bleeding on the brain, Shuaib said Monday. There is a drug available to open up the arteries to prevent brain damage but the treatment can only be applied once a brain hemorrhage has been ruled out, he said. Opening up the arteries on someone with a brain hemorrhage can do a lot of damage, he added. A CT scan of the head is the best way to determine what has caused the stroke, said Shuaib. The University of Alberta Hospital sees 2,800 people with strokes every year, with 500 of those coming from rural areas, sometimes a two-hour ambulance ride away, he said. The stroke ambulance will be able to meet up on the highway with a regular ambulance carrying a suspected stroke patient. A scan can be done roadside and the patient evaluated by specialists at the U of A hospital using video tele-conferencing. Along with a CT scanner, the ambulance is equipped with hydraulic levelling gear, audio-visual equipment for teleconferencing, and a mini blood lab. "To us, a full recovery is a home run," Shuaib said. "Everything else doesn't count." One in three patients treated in the first 90 minutes following a stroke make a full recovery, he said. For those treated within three hours, one in eight make a full recovery. Put another way, out of 100 patients who have had a stroke, about 15 per cent will die, and approximately 28 per cent will make a full recovery and be able to go home, he said. The remainder end up with varying degrees of disability, with about 20 per cent going into nursing homes, the most expensive type of care. Each year of care in a nursing home can cost between $100,000 and $150,000. If all 100 patients were treated within 90 minutes following their strokes, 25 more would make full recoveries and go home, he said. "We're convinced we'll be able to show to our government that you're literally saving millions of dollars by going out there and treating these patients early," Shuaib said. If the three-year pilot proves as successful as anticipated, more of the specialized ambulances can be built and used for trauma or other neurological emergencies, he said. "If we can potentially see these patients in the periphery, and prove they've had a scan, they've had a consult, we can turn them around and take pressures off our emergency department also."